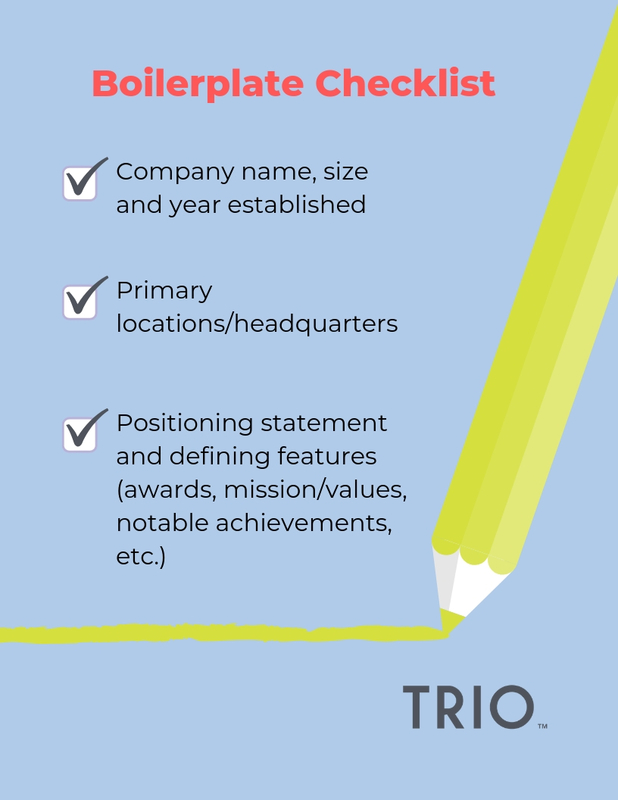 How to Make Your Boilerplate Stand Out | Trio Solutions Inc.
To begin, think about what you want people to know about your company. Is it that you started in 1912 with one location and have grown to 700 globally? Is it that you value diversity or have given back to the community in a notable way? Have you invented a product that stands out from the pack and has made a difference in the world? Identifying what makes your company unique is what will make your boilerplate stand out from the rest. To get a sense of what you want to include and what you want to avoid, research other successful companies to see what they’re doing right (here’s a good place to start). We recommend steering towards statistics and statements that will wow the reader and stick with them; on the flip side, stay away from using too much industry jargon that will confuse or bore the reader. If you’re using the words innovate, cultivate and strategic all in one sentence, go back to the drawing board. Pro tip: keep your SEO in mind by using relevant keywords to your field. Press releases are bounced around websites all over the internet, and now’s the time to capitalize on this opportunity by thinking in-depth about ranking strategy. Don’t forget to read our press release tips to pull it all together!